Wild pigs, wild hogs, wild boar, or feral pigs (as they are commonly known in the state of Florida) are not a native animal species. They are believed to have been introduced into Florida as early as the 1500s by Spanish explorers. 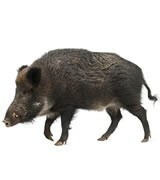 Wild hogs are not as common as some other household pests, but they are present in Critter Control’s service areas. Many people don’t know how to identify wild hogs or will confuse them with domesticated pigs. This is particularly true if many community members raise their own pigs or hogs. Critter Control experts can identify wild hogs on sight and educate you about them, including what attracts them to your home or business. Wild hogs share many characteristics with domesticated pigs, but key differences exist. Like domesticated pigs, some wild hogs have coarse hair located close to the skin. Others, however, are covered in long, coarse hair. Some wild hogs have tusks; others do not. While domesticated pigs have short, curly tails, it is more common to see a wild hog in Tampa with a long, straight, hairy one. Wild hogs weigh between 175 to 200 pounds, making them on par with some domesticated pigs. However, wild hogs can be smaller than some species; the market weight of domesticated pigs can be 225 to 300 pounds. Domestic pigs are often pink or white, although they come in several other colors and even patterns (i.e., a black and white pig). Wild hogs, on the other hand, are more likely to be brown, reddish-brown, white, or black. Like many other household pests, wild hogs are a nuisance because they destroy vegetation. They are particularly interested in farm crops and are found on farms and similar properties. Their foraging can devastate farmers’ yearly yields, and their waste often contaminates food supplies. Wild hogs are also notorious for contaminating water supplies with urine and feces. Be vigilant if you have a lake or pond on your property or live near an unfiltered well. If you have a wild hog problem, contact Critter Control of Tampa or call 813.948.0870 right away. We will help you identify the hogs and form an exclusion plan.